Welcome to 'Cnoc an Theine', a beautiful three-bedroomed self-catering cottage in the tiny crofting community of Aird, at the southern tip of the magical Isle of Skye. Nestling in its own grounds high above the Sound of Sleat, the cottage is a modern comfortable home from home located in the heart of some of the very finest scenery in Scotland. Come and make a holiday of a lifetime in Sleat, often known as the ‘garden of Skye’, but now re-inventing itself as ‘perfectly Skye’. From the comfort of the cosy lounge room there are spectacular views across the Sound to the silver sands of Morar, the remote Ardnamurchan peninsula and to the west, the famous 'Small Isles’ of Muck, Eigg, Rum and Canna. Some of the finest sunrises can be seen from Aird, so get up early and see some ‘fire in the sky’. 'Cnoc an Theine' was purpose-built as a holiday home in 2004, and is equipped with everything you will need for a memorable holiday on the Isle of Skye. With two double bedrooms, and a twin room, the cottage will sleep six and provides a baby cot for our tiny visitors. We welcome guests with special needs with all doors, electrical switches and shower room designed for those individual requirements. A ramp to the spacious lounge provides easy access for visitors in wheelchairs. As the cottage is fully enclosed in its own grounds we welcome a well behaved dog by arrangement. We now have hi-speed satellite broadband for wireless enabled laptops, with a Fair Usage Policy in order to consider following guests. 'Cnoc an Theine' (gaelic for ‘hill of fire’) makes a perfect base to enjoy the romantic Isle of Skye and to explore further afield to the mainland to visit such iconic landmarks as Eilean Donan Castle and Plockton, ‘jewel of the Highlands’, or further still to the Applecross peninsula, travelling via the highest mountain pass in Britain, the famous ‘Bealach na Ba’ or ‘pass of the cattle’. Be sure not to miss the famous Clan Donald Skye, ancient seat of the Clan Donald and the ‘jewel in the crown’ of Skye’s visitor attractions. Enjoy 40 acres of manicured gardens and nature trails, the ruins of Armadale Castle, visit the famous ‘Museum of the Isles’, or just take a coffee and cake in the beautiful Stables Restaurant. There is something for everyone. Nearby to the cottage is the often deserted sandy beach at Camas Daraich, at the Point of Sleat, a splendid walk across the rolling hills of south Skye. Be sure to keep an eye out for our local wildlife, from eagles and buzzards, dolphins and whales, and if you are lucky the elusive otter found around the rocky coves of Sleat. Skye is famous for the challenging Cuillin Hills, Britains finest mountain range, but for the less energetic there are walks to suit all abilities, many just a few miles from the cottage. Skye and Scotland’s west coast are home to some of the best visitor attractions in Scotland, we have listed some of these on our links page, and would be delighted to recommend things to see and do, especially for our younger visitors. Sleat is home too, to some of the finest restaurants in Scotland, including Kinloch Lodge, or take a pub meal in the nearby Ardvasar Hotel or the Eilean Iarmain hotel at Isle Ornsay. 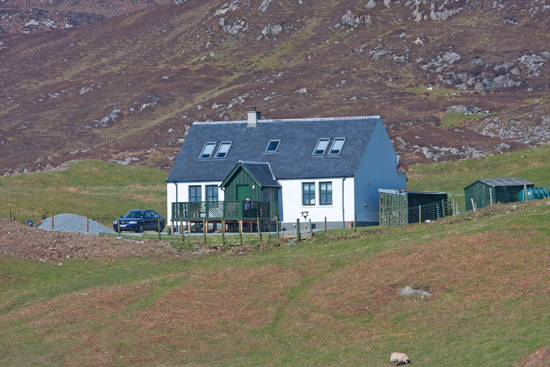 Welcome to 'Cnoc an Theine' where you will be assured of a warm wonderful home from home cottage, and all that you need for a relaxing and rewarding holiday. Come and enjoy the unique and romantic Isle of Skye, and take home memories to last a lifetime! We look forward to welcoming you, and a special welcome for our many returning guests and friends!